Clark Tenakhongva was born in Keams Canyon in 1957 and was raised in the Third Mesa village of Hotevilla. His father is of the Corn and Water clans. His mother is of the Rabbit and Tobacco clans. He is a respected traditional cultural practitioner and has a lifetime of experience singing Hopi songs. 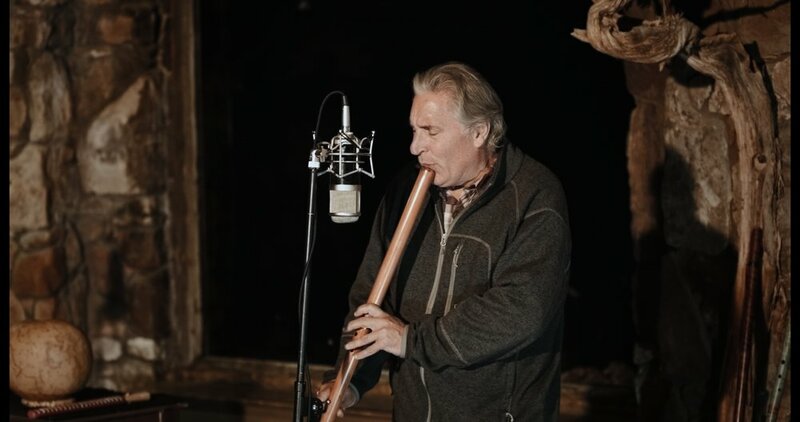 Clark has been invited to sing on stages around the world, has four recordings on Canyon Records, and has won numerous awards for both his music and katsina carvings. Gary Stroutsos is a master flute player whose contemplative music and time-honored stories evoke the lands and cultures that he has studied over his 35-year career. Gary was a founding artist for Makoché Records, dedicated to the music of American Indian artists, and was the only non-native invited to record on that label. His discography includes over 40 acclaimed recordings, including Remembering the Songs, which celebrates the old songs of three indigenous tribes. Matthew Nelson is an ethnomusicologist and host of Global Rhythm Radio on KXCI-FM who has studied a variety of drumming traditions with master musicians, including tabla with Pandit Sharda Sahai of the Benares gharana. While working as an archaeologist, Matthew became interested in the ceramic tradition of the Southwest, and combined with his love for indigenous music began an exploration of clay pot percussion. Perched on the edge of Grand Canyon within view of the confluence of the Colorado and Little Colorado Rivers, Desert View Watchtower is near the place where Hopi emerged from the Third World into the Fourth World.